The Christmas naughty list is usually reserved for misbehaving boys and girls, but this year, it's the elves that find themselves listed in black and white. Welcome to Elf Wars, an epic North Pole battle for Christmas supremacy that gives the term Cold War a whole new meaning. Join the Good Elves and Bad Elves in an all-out war for control of Santa's Workshop in this 50-payline online slots game that pits Santa against Rudolph, good against evil, and you against the chance to win enough money to buy and sell Santa's workshop ten times over. With a top award of 50,000x your bet per line plus that chance to pop a random jackpot that resets at $2,500, it doesn't really matter which side you're on in Elf Wars. It's not just about dodging bullets as the elves go to town, fighting for control of everyone's favorite holiday. This game is about matching the right symbols and winning free games so every spin feels like Christmas. Just look for the four special symbols—Good Elves, Bad Elves, Rudolph, and Santa—and match the right combination to enter one of the feature guarantees. Santa Strikes Back hooks you up with seven free games with a 1x prize multiplier. Hitting a candy cane lights a start on top of the reel on which it appears. When all fives stars are lit up, the number of free games remaining resets to 7 and the prize multiplier grows by 1. Rudolph's Revenge features seven free games as well, with prizes multiplied by two plus the number of Rudolphs that you hit. Rudolph's Rampage takes you inside Santa's totally ransacked toy factory. Find the three missing elves to win up to 50 free games. And if you find the right combination of presents within the game feature, you'll win even more. You'll find even more hidden gems in Elf Wars. Click the Help button in the game for everything you need to know. Forget about the 12 days of Christmas. In Elf Wars, everyone's favorite holiday arrives a lot sooner—even with the Bad Elves on a rampage to destroy Santa's workshop. With the Games Feature Guarantee, you're guaranteed to play one of the feature games at least every 150 spins. If you don't, the software will send you into free game mode automatically. And if you can't wait 150 spins to see what's under the tree, you can try to manually trigger the free games feature. But remember, by trying to trigger the bet yourself, you run the risk of resetting the count back to 150, so choose wisely. Jackpot: Elf Wars includes a jackpot that pops randomly. 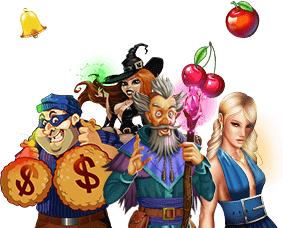 The reset amount for the jackpot is $2,500, making it one of the most rewarding online casino jackpots at Slots of Vegas. Substitute Symbol: In Elf Wars, there are two substitute symbols—Rudolph and Santa. They can substitute for any other symbol in the game, with the exception of the scatter symbols. Scatter Symbol: Not to be outdone by the two substitute symbols, the Good Elves and Bad Elves make up the two scatter symbols in Elf Wars.